The problems only started to become clear. Recruitment being a obvious one. 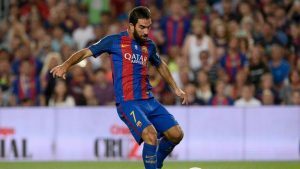 Apart from Neymar and Luis Suarez, Barcelona’s recent transfers have been expensive failures; Arda Turan, Andre Gomes, Vidal and Paco Alcacer have failed to make much, if any impact. Since the World War 2, only two Barcelona managers ever stayed for more than 4 seasons. Both are dutch; Rijkaard and Cruyff. The youth system, La Masia or as former president Laporta liked to call it the “Dreams Factory” is drying up and Barca are selling their best talents for nothing. Barcelona stars are exiting their prime and yet untouchable. Pique is 30, Mascherano is 33, Messi is 30, Suarez is 30, Iniesta is 33, Jordi Aba is 28, Busquets is 29, Rakitic is 29. The average age of the team is 29 but Barcelona are not seeking any replacements. With the club seeking to sign a 29‐year old Paulinho, its safe to say they are a hopeless case. Although the team is still good enough to beat most sides (with reckless abandon) but are very vulnerable in their off days. Barcelona in 2017 – An unbalanced squad with poor recruitment, carried by world class stars, an abandoned academy and no commercial performance. Barcelona are not in a crisis right now, but soon they will be. Slowly but Surely. A lot of credit goes to Sweeper Ability.